The Linköping Horticulture Society was founded on 22 March 1859 to create an English style city park for recreational, educational and horticultural purposes. In 2009, celebrating its 150-year existence, the city park’s attractiveness relies on its old trees, herbaceous borders, streams and ponds, the Belvedere tower, rose collections, the Tropical House, a “Sunken Garden” by landscape architect Ulf Nordfjell and an area for ephemeral “gardens of ideas”. The Linköping Horticultural Society was founded on 22 March 1859 to create a public park in the city. It should become the green lung for the city, offering green areas and promenades for walking and recreation. A second aim was to get the people interested in gardening and cultivation of plants, vegetables and fruits. The entry section of the park, flanked by two “Swiss Style” houses, has been changes most over the decades in accordance with prevailing garden trends and fashions. At the rear, in linear perspective, was the restaurant built in 1881 in Moorish style. The flowerbeds were designed in the “German style”, which prevailed during the second half of the 19th and the early 20th centuries. Typical were soft lines, with accents set by exotic and especially annual plants in urns and round, star-shaped or almond-shaped flowerbeds, so called “flower embroideries”. During the second half of the 20th century these flowerbeds were replaced by lawns with flower borders on each side of the main path. In 1977 the restaurant was destroyed by a fire and has not been rebuilt. Instead a rotund a rotunda of roses has been installed with the pergola guiding the view to the great fountain. In 2001 a new entry section, created by the landscape architect Ulf Nordfjell, was opened. With a circular, elevated flower-bed between the two flanking buildings, a “sunken garden” and half-moon shaped flowerbeds, Nordfjell’s design is reminiscent of 19th century ideals while the choice of plants mirrors the current trend to work with perennials and ornamental grasses. Käringsbäcken (The Brook of Hags”) which runs through the park was revived in 1977 as one element in the plan to restore the original 19th century park. The Tropical House, a 17 meters high tetraeder in glass, was opened in 2004 as a substitute for the burnt down restaurant. 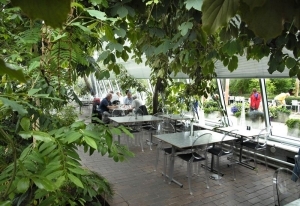 The Tropical House contains a restaurant set around a collection of Mediterranean and useful tropical plants. The “Belvedere Tower” built in 1880 on the highest rock in the park, allows a wide view on the park and neighbouring quarters. The tower was renovated in 2001 and houses a café. A further enhancement of that site was agreed in 2009. In 2008 “Doctor Aman’s Garden, a “Garden of Ideas”, was opened. It replaces the previous “assortment garden” from the sixties. Today a rose pergola, rippling water and trellises with climbing plants can be found here. The garden has been designed by landscape architect Helena Hasselberg and Henrik Morin, an expert on roses, has participated in the selection of roses. From May onwards, about 80 varieties of classic, modern and new roses are in bloom. Among them the white climbing rose Venusta Pendula (Rosa x arvensis) and the purple violet “Veilchenblau”. Modern ground covering roses as the pale rose “Sommerwind” and the dark rose “Pink Bells” or bush roses as the pale rose “Stanwell Perpetual” and the peach coloured “Shropshire Lass” add to the colourful impression. From 2009 onwards, four “rooms” in the southern part of the garden will be redesigned by garden creators every two years, offering new ideas and designs and inspiring visitors. On the 9th and 10th May 2009 a first set of four new gardens has been created. These thematic gardens of 55 sqm each were designed and installed by other municipalities and their head gardeners as a contribution to the 150th anniversary of Linköping’s city park. The garden “FlyT” by Helsingborg is a very modern mix of metal, water and stone, while Malmö’s “Cut” reflects the idea of picking flowers to bring them indoor or to give them away as a gift. The gardens “Summer Night” by the Sävsjö community and “New Energy in an Old Landscape” created by the Wij Gardens in Ockelbo combine old and new materials, designs and themes in an attractive and inviting way. Different in style, design and materials used these gardens add a great variety to the city park and can act as inspirational showcases for private garden owners as well. The trees in the park tell the botanical history of the park. The variegated cultivar of hawthorn (Crataegus monogyna “Variegate”) and sycamore “Leopoldii” (Acer pseudoplatanus f. variegatum “Leopoldii”) with yellow variegated leaves are typical examples of the preference during the 19th century for variegated species. The two black walnut trees (Juglans nigra) are the largest of their kind in Sweden and were probably planted already around 1880 when Christian Frederik Kroné was the first director of the park. Traditionally “The Friends” of the Horticultural Society each year present a tree to the park as a gift. New lights and illuminations make a stroll through the park during the evening attractive for everybody. The Bee House, the Nature Centre, and the green houses with their plant sales show that the function of the park as a centre for nature, ecology, geology, flora and fauna is still of major importance today. The historic buildings that can be found within the park – such as the two entry houses, the Red Barn and the Krogsfall Cottage – allow visitors to see and to explore elements of the traditional, Swedish cultural landscape. 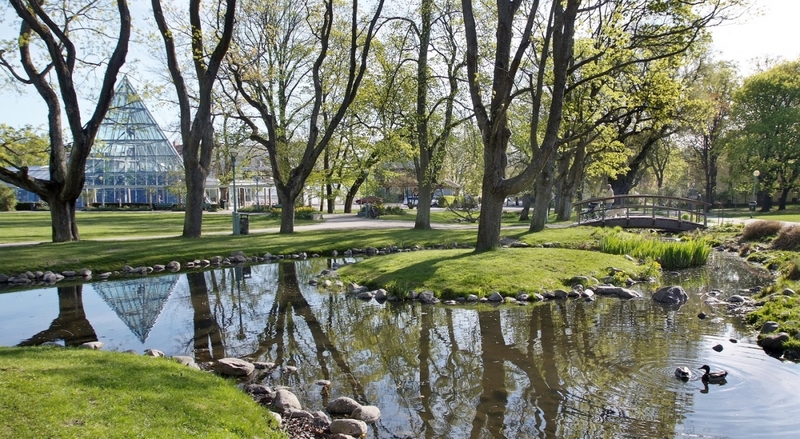 Linköping’s city park, with its symbioses of traditional and contemporary garden arts and design, plays an important role for the local community and social life in Linköping. The park is a central meeting place. During the entire year concerts, markets, festivals and much more make use of the park as a historic, vivid and beloved quality setting. The park is deeply rooted in the consciousness of the citizens and represents the history of the city and the people who lived and worked here. Opening times: The park is open all day, all year round. The roller-skating rink invites you as an ice rink during the winter. Open-air concerts during the summer. Christmas Market. Museum: The farmhouse Krogfallsgarden, a listed building from 1740, hosts a museum on local heritage. Information available from the tourism office at the entrance of the park. Information panels within the park and labels at important trees. Dogs are to be kept on leash!